Deep sea diver Tom Pritchard was careful, expert, experienced. And yet. Two hundred feet below the waves, Tom Pritchard had a job to do. One of the chains attaching a mooring line to the famed wreck of the Andrea Doria had come loose, and Pritchard, 64, had ventured down with two other crew members from the dive boat John Jack to secure it. When the job was done, they released a few pieces of foam into the dark water to float up to the surface — an “all-clear” message to the divers waiting high above. Pritchard, a seasoned scuba diver with the experience and the certification necessary to make the challenging dive to one of the world’s most alluring shipwrecks, had a few minutes to explore before he had to ascend. He and his companions set out separately July 21 into the 59-year-old shipwreck known all over the world as the Mount Everest of scuba diving. It was in part the danger that earned the Doria her nickname. No amount of preparation or caution can wring every risk out of the cold, dark water. About an hour and 15 minutes later, the first of the three crew members, Shawn Sweeney, arrived at the surface. About 15 minutes later, the next crew member, Terry Martzall, surfaced, handing up his gear before climbing onto the stern. He looked around for Pritchard, the bearded, jovial retired professor known on board as Doc. A team of Italian divers went on an expedition to take underwater footage of the shipwrecked Andrea Doria in July of 1968, twelve years after the Italian luxury liner sank off the coast of Nantucket. “He said, ‘Hey, Doc was supposed to come up. Where is he?’ ” said Nate Garrett, an experienced diver and instructor who paid to make his long-awaited first trip to the Andrea Doria. Martzall said he thought he’d seen Pritchard just below the surface, Garrett recalled, and went back in the water to look. There was no sign of him. The Coast Guard was called. Planes searched from the air, and a cutter trolled the area. Tom Pritchard went missing while exploring the wreck on July 21. Deep underwater, another diver on the wreck, unaware of the frenetic activity above, saw something that seemed out of place. It would be an hour before that diver could surface and report on what it seemed to be. The Italian luxury liner Andrea Doria sank in July 1956 after colliding with the MS Stockholm in what became an infamous maritime disaster. Of about 1,700 passengers and crew on board, about 50 people were killed. And though the Doria has been lying on her starboard side on the ocean floor ever since, her death toll was far from finished. In the 59 years since the Doria went down, more than 15 divers have died attempting to reach the wreck. They’ve gotten lost in the ship’s collapsing compartments or fallen prey to faulty equipment. They’ve been stricken by the debilitating decompression sickness known as the bends or collapsed when their hearts simply gave out. But the Doria’s draw has never abated. Resting under about 250 feet of cold, dark, treacherous water, the Doria has become one yardstick by which the world’s best divers measure themselves. Divers train for years and spend tens of thousands of dollars on sophisticated equipment and custom gas mixtures that allow them to plunge far below the limits of recreational scuba divers. Some simply kneel on the historic hull. Others rummage through the wreck in search of mementos — china from the well-appointed cruise liner to take home and frame. And every once in a while, someone gets lucky. In 2010, two divers from New Jersey unearthed the 75-pound bell that once adorned the Doria’s deck. Some of that cachet comes from the wreck’s place in history, the drama of that 1956 night well-chronicled in books and movies. Its remoteness only adds to the allure — about 60 nautical miles from Nantucket, the Doria lies out near the continental shelf, where the ocean plunges far deeper. And though few divers acknowledge it openly, the danger is for some its own draw. 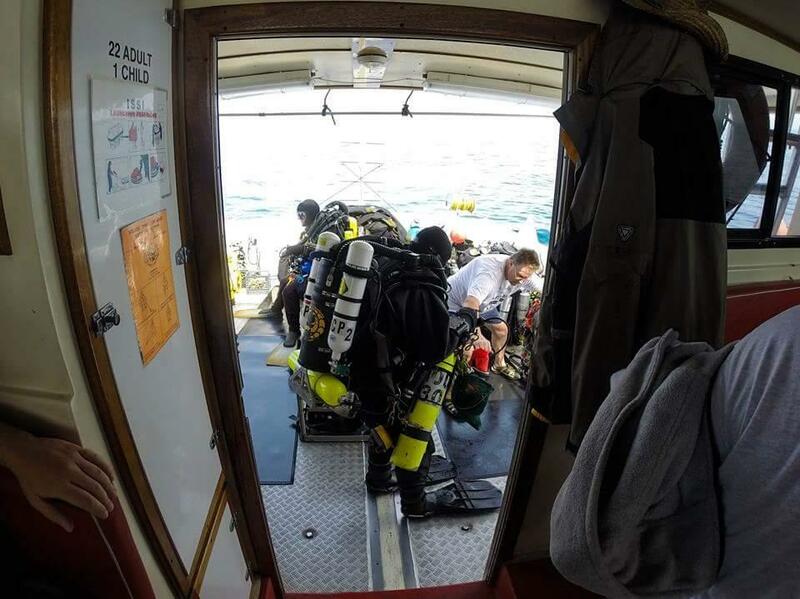 “There’s so many things that can go wrong on a dive,” Hanzl said, and divers who are advanced enough to attempt to reach the Doria are intimately aware of each potentially deadly hazard. But only some are within a diver’s control. 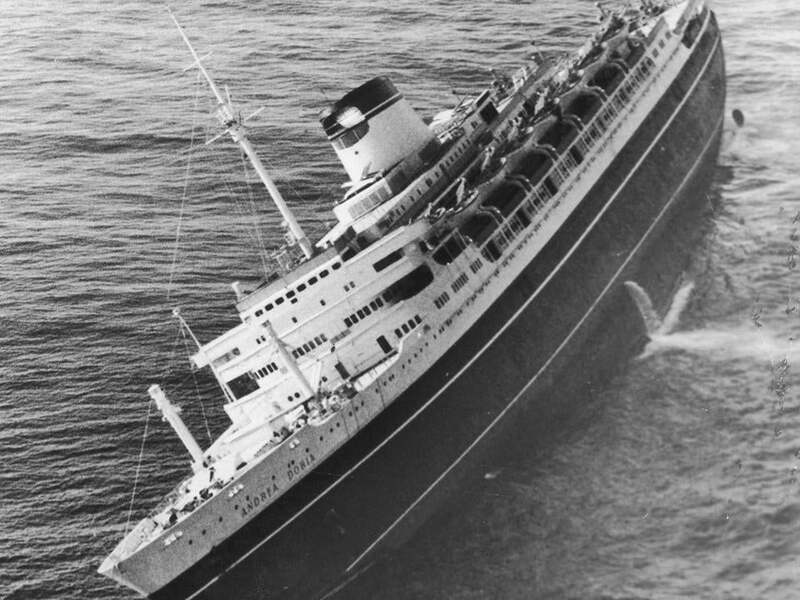 The Italian luxury liner Andrea Doria sank in July 1956. Tom Pritchard adored the ocean, but he never cared much for the surface. The waves beat on him when he emerged after a dive, and bounced him around in the John Jack’s galley, where he was bunked during the 10-hour overnight run to the Doria. But down below the water’s surface, even just 10 feet or so, everything goes quiet. Down there, Pritchard was comfortable, said his friend and diving buddy Richard Huck, who had gone for a dive in a Pennsylvania quarry with Pritchard just days before the Doria trip. Huck had been Pritchard’s divemaster early on, and the two were fast friends. The onetime pupil had surpassed his divemaster, but they still dove together often. Pritchard took up diving late in life, aiming only to have some fun during an Australian vacation in 2001. As he advanced through recreational diving and into what’s known as technical diving, he pursued more challenging goals, traveling the Eastern Seaboard and eventually visiting the Doria several times. But Pritchard, who was a professor of neuroscience at Penn State Hershey College of Medicine until his retirement a year ago, was no daredevil. Tom Pritchard (center) prepared for a dive down to the Andrea Doria wreck on board the John Jack on July 21. Pritchard never surfaced, and his body has not been recovered. Pritchard, with about 1,000 dives under his belt, had a reputation for careful preparation and attention to detail. Two days before he died, Pritchard and a diving buddy drove the six hours from Pennsylvania to Rhode Island, where the John Jack had been chartered by Sharky’s Underwater Expeditions, a Missouri-based diving outfit. Pritchard was on board as part of the John Jack’s crew, intending to work and dive on back-to-back Doria trips. But on Monday, after the rocky overnight run to the Doria site, Pritchard wasn’t feeling up to the challenging dive. So Pritchard, patient and cautious, helped others ready their equipment and seal up their suits. By Tuesday morning, Pritchard seemed to have found his sea legs, Garrett said. He traded stories over breakfast with Garrett, who was immediately fond of the easygoing older diver with the white beard and sharp wit. 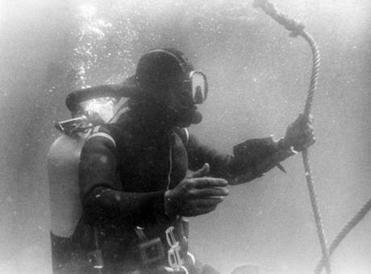 When the mooring tethering the John Jack to the Andrea Doria needed to be resecured, Pritchard suited up: a sophisticated diving apparatus called a rebreather on his back; a dry suit covering his body; heavy, bulbous tanks filled with the various compressed gasses strapped to his back and under his arms. For the last time, Tom Pritchard dropped below the waves. For a skilled diver like Pritchard, the journey down to the Andrea Doria is fairly simple. After splashing into the water, he would have held onto the mooring line attached to the wreck below and simply allowed himself to sink. 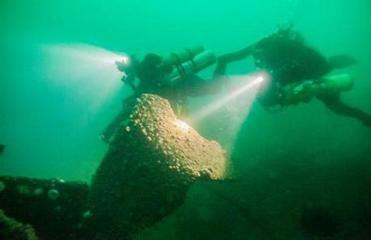 Divers examined the stern of the ship, which sank in July 1956 after colliding with the MS Stockholm. Save for minor adjustments to his rebreather, there would have been little to do on the roughly four-minute journey down. At about 200 feet below the surface, the amount of oxygen in the air we breathe on land becomes toxic under the pressure. Through the rebreather’s controls, divers switch to a gas mixture that won’t knock them out or send them into convulsions, substituting some of the oxygen and nitrogen in air for another inert gas — helium. The resulting mix of three gases is called trimix. Water that’s greenish near the surface darkens and then turns gray. At the bottom, it’s nearly black, and the hulking wreck looms in the dark. Alighting on hands and knees, divers greet the Doria on all fours. But for all the preparation and advanced equipment, divers have only a few minutes to explore the Doria. The more time divers spend breathing the specially tailored mix of gases required to survive at such depths, the longer they’ll have to spend making their way painstakingly back to the surface. A typical Doria dive includes only 15 or 16 minutes exploring the wreck before divers must leave. During those few minutes, divers affix strobe lights to the mooring line to help find their way back. Some hook lines of their own, wound into reels on their equipment, onto the wreck near the mooring line so they can find their way back when their time in the wreck runs out. Some of those who have died got tangled or lost in the wreck. Others have panicked, spit out their mouthpieces, and drowned. But most make their way back to the mooring to start their long, slow ascent. Every minute at the bottom increases decompression time dramatically. For a dive of typical duration, the return to the surface requires about an hour, with stops nearly every 10 feet, pausing for precisely timed intervals. The gases inhaled and absorbed at the pressurized environment far below the surface can bubble in a diver’s blood like the soda inside a can when the pressure around starts to decrease on ascent. The stops allow time for the body to acclimate, off-gassing the helium and nitrogen safely while breathing in an increasingly oxygen-rich mix. Foot by foot, divers make their way toward the surface, lightly gripping the line. Keeping a consistent depth in the water can be arduous: The current can be strong, and the boat’s bobbing moves the line, ripping it across palms, tearing through gloves as divers wait out each decompression stop. On board the John Jack, it took only moments to realize that Pritchard had vanished. Martzall said he thought he’d seen Pritchard at the 20-foot decompression stop just a few minutes before, according to Garrett and others on board. Pritchard, Martzall told them, had signaled to him and headed up to the boat. Martzall frantically got his suit back on and plunged into the water to look for his friend below the boat. When there was no sign of Pritchard below, someone radioed the Coast Guard. “We started throwing garbage overboard,” Garrett said — a way to track the current and give Coast Guard rescue crews a trail to follow in case Pritchard was bobbing on the surface. Within about three minutes, a Coast Guard plane was overhead. Down at the Doria, the handful of remaining divers were unaware of the chaos overhead. The last two divers approached the line to retrieve their strobe lights and saw a third strobe affixed to the line. One of the divers, who asked not to be named because the small, close-knit diving community is traditionally tight-lipped, looked closely at the left-behind strobe. The diver progressed through the necessary decompression stops aware that whoever left that strobe on the line may have been lost in the wreck. More than an hour after Pritchard went missing, the diver finally emerged and reported seeing a strobe with his initials clipped to the line. By then, the search at the surface — based on Martzall’s account of seeing Pritchard just below the boat — was already well underway. But if Martzall had instead seen Sweeney, who surfaced several minutes before him, then Pritchard may have never left the Doria. “Being on a rebreather, this guy could have been alive and caught in a net,” said one of the divers who asked to go down to search for Pritchard. He also asked not to be named because he said he feared not being allowed on future expeditions. Three divers who were on the boat said the boat’s two captains — owner Rich Benevento and Mark “Sharky” Alexander — declined to allow anyone down to look for Pritchard on the wreck. Benevento declined to comment for this story; Alexander did not respond to phone, e-mail, and social media messages. But some experienced divers and a Coast Guard official said the decision to keep everyone aboard the boat was — while difficult — likely wise. Hanzl, the aquarium dive safety officer, said that had he been a diver on the John Jack that day he would have wanted to go down to look for Pritchard. But had he been the captain of the boat, he said, he wouldn’t have allowed a passenger to take that chance. “I’m glad I wasn’t the decision-maker on that boat,” Hanzl said. No one knows for sure where Pritchard drew his last breath. If Martzall — who declined through a friend to discuss the incident and did not respond to messages — really had seen Pritchard near the surface, then his body could have been carried hundreds of yards away as it sank. 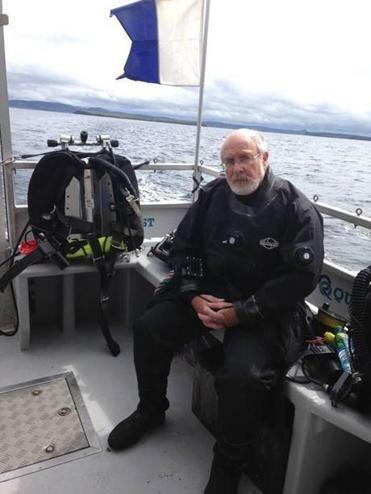 Richie Kohler, a wreck diver and shipwreck historian who has led his own Doria expeditions on the John Jack, said Pritchard’s fellow crew members owed it to him to search. When a diver was lost near the surface on one of Kohler’s trips, he said, he triangulated his position by gauging the current and searched the ocean floor until he found the deceased diver, who’d died of a heart attack. But that may not always be possible, Kohler acknowledged. Weather conditions were deteriorating. The John Jack’s ladder had broken off while the boat was tooling around the dive site, and an aluminum ladder had been attached to the diving platform, making boarding the boat tricky. Risking still more divers to search for Pritchard may have been unwise. But Kohler said he asked to tag along on the John Jack’s subsequent trips to the Doria so he could search for Pritchard’s body and was rebuffed. A couple hours after Pritchard vanished, the John Jack left the scene a day ahead of schedule and headed for port. About 40 hours after the Coast Guard arrived, the search was called off. If Pritchard ever surfaced, nobody saw him. What precisely happened may never be known for sure. Whether an equipment failure or a medical emergency incapacitated him in the wreck, or another swell brought the John Jack’s hull down on his head — or something else entirely — the array of diving dangers can seem as vast as the sea itself. If he did ascend near the boat, his body may eventually emerge in a fishing boat’s net, Kohler said. If he never left the Doria, a diver may one day discover him on another expedition. But for now, somewhere near the Andrea Doria, Tom Pritchard is buried far below the waves.